While returning back from Mara to Nairobi, just outside the reserve area, Robert took us to a Maasai village. Mara Serengeti is bounded by Maasai pastoral ranches to the north, east and west. Who are the Maasai - the internet as usual gives us the answer. They are a semi nomadic Nilotic (word derived from Nile) population, composed of multiple independent tribal groups who subsist mainly off their cattle, goats, and sheep in the savannahs of southern Kenya and northern Tanzania. I dug deeper to find out the history of the land. In the 19th century, Maasai land stretched from northern Kenya, to the central lakes (Baringo, Naivasha, Nakuru, Natron), to the rich savannah grasslands of the Serengeti plains in northern Tanzania. Colonial intrusion divided the Maasai between British Kenya and German Tanganiyka in 1885; and by 1913 the British in Kenya had evicted Maasai from their lands north of Nairobi to make room for European settlers. Confined to less than 60% of their pre-colonial range, the Maasai were further restricted by the creation of wildlife parks and reserves in the 1940s and 1950s (all the big names were once Maasai land: Amboseli, Nairobi National Park, Maasai Mara, Samburu, Lake Nakuru and Tsavo in Kenya; and Manyara, Ngorongoro, Tarangire and Serengeti in what is now Tanzania). These parks were originally designed for settler recreation, but by the 1980s, they had become the leading source of income for Kenyan and Tanzanian governments. The Maasai are now grappling with the realities of privatisation of land by farms and commercial estates (private ownership was an alien concept to Maasai), economic dependence on market forces, drought in the grazing lands as a result of climate changes, competition for dwindling resources (e.g. overgrazing) leading to ecological degradation and the need for formal education. Given the history of their glory days and their fierce reputation of being “untamed” (the Maasai stood against slavery and hence outsiders looking for people to enslave avoided them), our first impressions of the village were a little disappointing - the whole setup felt more like a show targeted at tourists. I guess it is one of the avenues of earning the much needed money. The village elder who took the money from us had typical Maasai stretched earlobes. Various materials are used to both pierce and stretch the lobes by Maasai, including thorns for piercing, twigs, bundles of twigs, stones, the cross section of elephant tusks and as I have read even empty film canisters! Fewer and fewer Maasai, particularly boys, do it these days (our guide told us the schools have completely banned this for some time now). Glancing at the elder’s ears again, I pondered about the notion of beauty – how completely divergent and contextual it is. Traditional Maasai lifestyle centres on cattle; in fact it is one of the key measures of a man's wealth. This village also had its share of cattle and goats and Adi had to fight through hordes of flies to pat a kid. It is not too difficult to make out Maasais with their lean physique, with absolutely no trace of adipose tissue anywhere. Our guide revealed the secret behind this fitness level - milk and roasted meat from cattle without added sugar, salt or oil (though they live alongside wild animals, they do not kill them for food). They also drink cattle blood obtained by puncturing the jugular vein from close range, though the practice is waning these days due to non availability of live stock. I have seen this on television - though totally against all established rules of modern society, I have to admire the extreme precision with which the acts are done and the fact that the animal actually stays healthy afterwards since it is tended to till it heals. Maasai also take fruits, barks, roots and stems from plants for snacks, soups and drugs. By this time, a group of men had changed to traditional Maasai dress (shuka or sheet traditionally worn wrapped around the body, one over each shoulder, then a third over the top of them – though not all wear all three sheets, and then an additional sheet is worn as a skirt or lungi, both men and women seem to wear the same way) – splendid display of red with sprinkling of blue, purple and yellow; adorned with attractive jewellery. A uniform part of their attire was the footwear – black rubber sandals; they told us that they make them from discarded car tires. Most of them were carrying long walking sticks (rungu) used for herding cattle. They came in a file and started what we now know as the famous Maasai competitive “jumping dance” (adumu), accompanied by rhythmic singing. One or two at a time would come forward and jump while maintaining a narrow posture, never letting their heels touch the ground. The higher the jump, the higher was the pitch. They were pretty accomplished jumpers, some soaring to great heights; no wonder since when not doing for touristic display, as they told us they would have to win the hearts of maidens with their jumps. At their urging we joined in as well with a dazed Adi, the distance between our feet and ground certainly not in the same range as theirs. When the dance was over, we moved within the boundary of the village. 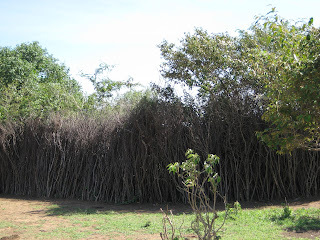 The boundary was a circular fence (enkang) made of thorny acacia – a protection against wild animals. It was the limit of men’s construction work also. All the houses (enkaji) inside were built by women – if the ladies want a home and someone to share the home, they got to do the hard work themselves (along with supplying water, collecting firewood, milking cattle, cooking for the family and raising children while the men graze). The not too spaced apart households inside a bounded fence emphasised the togetherness of a clan, at the same time the independent houses indicated the individual family space. The framework of the houses was formed of timber poles fixed directly to the ground, with walls and a water proof roof plastered with a mix of mud, sticks, grass and cow dung. To Adi’s immense displeasure, we went inside one of the houses and found ourselves in windowless pitch blackness (other than a couple of holes to let out the cooking smoke). The house was small, measuring about 3x5 m and standing only 1.5 m high. The entrance opening (no door) was so low that even I had to bend my head to enter, I wondered how these tall men manage day after day. As our eyes adjusted to darkness, we saw that the cattle had one room to themselves. In the rest of the space, the family cooks, eats, sleeps (bedsheet was another red shuka), socialises, and stores food, fuel, and other household possessions including a paraffin lamp – it is astonishing how little space we actually need to do all of these. The last piece of the show was making fire as their forefathers would do – a strictly men’s only business, a custom they follow to this day instead of using convenient match sticks (apart from proving the utility of men folk, it is environment friendly I guess). The Maasai tribesmen, unperturbed by the flies all around, took turns to rotate a wood stick (which I believe is African cedar collected by them from the mountains; aromatic resin of the tree makes it susceptible to fire) in a hole in a board (which per my understanding is made of sand stone gathered from nearby riverside areas) with great force. After few attempts, the friction generated the spark; which was then transferred to a kindling of dried sticks, twigs, grass and animal dung; soon resulting in a flame with the trapping and diversion of wind. Imitating us, Adi clapped too, clueless about the significance of one of the most vital discoveries of mankind and how it differentiates us from the rest of the animal kingdom. The tour over, we got back into the car; ready for Robert to take us back to “civilization”. The idealised television image that we see of African wildlife grazing serenely without any humans or domestic livestock nearby is false. Pastoralists have shared the savannah plains of East Africa with large herds of wildebeest, elephants, and lions for several millennia, often in beneficial symbiosis. There are probably some lessons to be learnt from the Maasai, their way of life and the indigenous knowledge regarding herd movements and land management. Tradionally at the end of the dry season, the Maasai would burn off the parched vegetation. This would rid the area of disease-carrying ticks, control the growth of less desirable grasses and improve soil quality with nutrient-ash. When the rains came; tender young shoots, favoured both by cattle and wildlife, emerged. The Maasai would then move their herds to the more arid areas, giving the naturally richer pastures time to recover until the dry season. Every community knew and defended the extent of their territory even though there were no legal titles or fences. If, however, the dry season became especially harsh, section boundaries were ignored and the different communities grazed their animals throughout the land until the rains arrived, as they believe that no-one should be denied access to natural resources such as water and land. Forced to shed their traditional ways, more and more Maasais are joining the mainstream professions these days, not to be left behind by the other more entrepreneurial tribes. Is that the only way forward? When we went to Hell's Gate National Park for the second time recently, our Maasai guide informed us that flowers from Oleleshwa, a local tree, is used for making fire. The fragrant leaves of the tree are used as deodorant after rubbing to generate scent. Our locality in Nairobi, Kileleshwa is named after this tree.